The men’s basketball team was unable to overcome a 1-21 showing from the 3-point line as Santa Barbara defeated the Matadors 70-64 Wednesday night at the Thunderdome. Despite shooting an atrocious 4.8 percent from beyond the arc, their worst mark of the season, CSUN nearly snuck away with the victory, trailing by as few as three with a little over 3 minutes to go. Unfortunately, the Gauchos were able to take advantage of the Matadors’ foul trouble, using solid free throw shooting to keep their lead throughout the second half. The Gauchos would make 16-19 free throws in the second half and a perfect 6-6 in the final two minutes to seal the win. But the big story was the Matador offense, which revolved almost exclusively around redshirt freshman Lamine Diane as the rest of the squad struggled to find their shots all night, leaving head coach Mark Gottfried frustrated with what was otherwise a solid game. “We have to make some shots. We can’t ask Lamine to get 50 every night,” Gottfried said jokingly. Diane, who did not get to the half-century mark, ended up with 28 points on 12-19 shooting, accounting for 44 percent of the 64 points that the Matadors put up in the loss. Sophomore Terrell Gomez, the second leading scorer in the Big West coming in to the game, ended up with only 10 points and went 1-8 from beyond the arc, while the third leading scorer, junior Rodney “Rocket” Henderson, had only nine points and missed all five of his 3-point attempts. The bench was also underwhelming, providing just three points and unable to supply any sort of spark to get the ball rolling. As Gottfried noted, the defense was good, allowing just 64 points after allowing 74.9 points per game coming in to Wednesday’s contest. 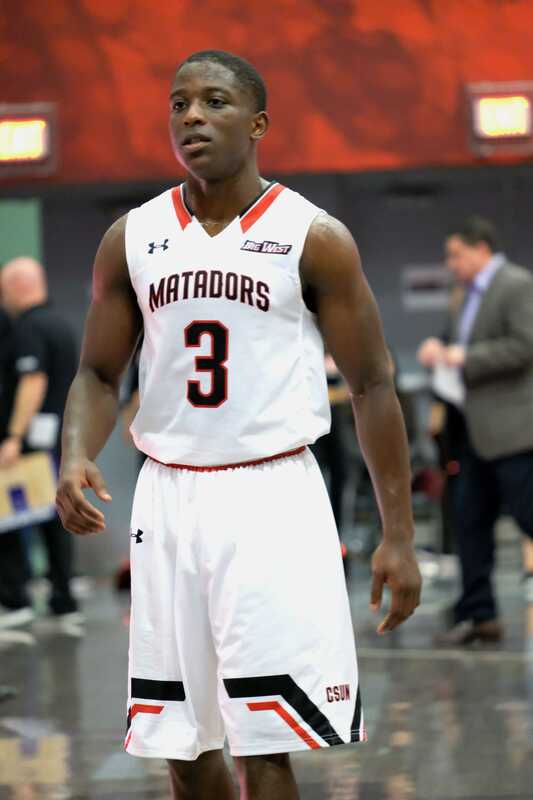 But defense can only get a team so far, with wins coming from production on both ends of the court, not just one side as the Matadors showed against Santa Barbara. After the loss, the Matadors sit at 10-14 and 4-4 in conference play, good for fifth place in the Big West standings. The Matadors missed a big opportunity to jump up in the standings, as a win would have vaulted them up above the Gauchos to second place, just two games back of Irvine in first. As things stand now, with eight games left before the Big West Tournament starts on March 12, the Matadors have little wiggle room to work with if they hope to finish in the top half of the regular season standings. Luckily for them, the schedule is somewhat favorable as five of the eight games are against teams with losing records in conference play, which could bode well for their chances to finish in the top half of the standings. The team will next travel to UC Davis on Wednesday, Feb. 13 for a 7 p.m. game against the Aggies before coming home to play Fullerton on Saturday, Feb. 16 at 7 p.m.